Finally pesto! I love it, bunches of basil, parsley, chopped green or black olives, sun-dried tomatoes, capers, garlic, anchovies mixed with olive oil, nuts or cheese. There are endless possibilities to bring one of the most satisfying meals onto the table, pasta with pesto. It’s so simple yet so special! When I make pesto I just follow my mood and appetite, picking what the kitchen herbs on my window sill offer and mixing it together with the Mediterranean fruits and vegetables preserved in salt or oil I keep in jars in my fridge. Sometimes I mix fresh vegetables in as well, like green asparagus or broccoli. Today is a broccoli day! I cook it al dente, put some of it in a blender and mix it with parsley, ginger, garlic, anchovy, lemon juice and olive oil. Some of the water used to cook the broccoli stirred in makes the pesto nice and smooth, it’s lighter than using just olive oil. 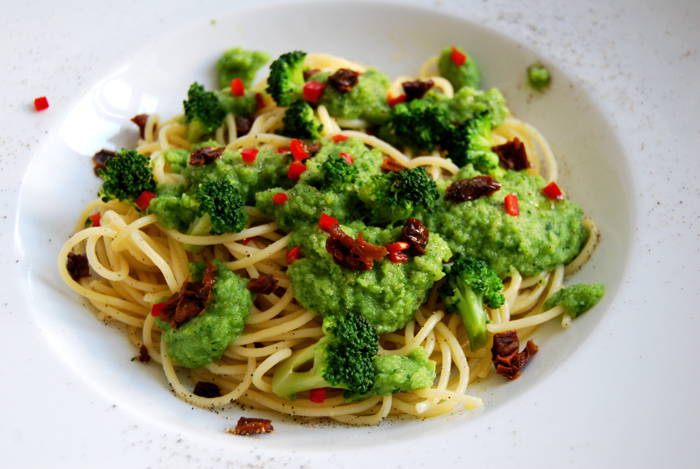 When the warm spaghetti has been mixed with the broccoli pesto, I sprinkle some broccoli, sun-dried tomatoes and red chili on top. There are lots of different flavours in this pesto but they blend in perfectly and allow the broccoli to show its fresh side. 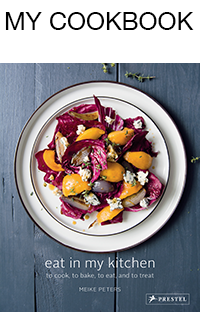 For this meal it’s best to warm the plates in a 75°C / 165°F warm oven for a few minutes. I prepare them while the pasta is cooking. In a large pot, bring water to the boil, add some salt and cook the broccoli al dente. Keep 1/3 of the cooked florets, cut into bite sized pieces and set aside. Cook the spaghetti al dente. 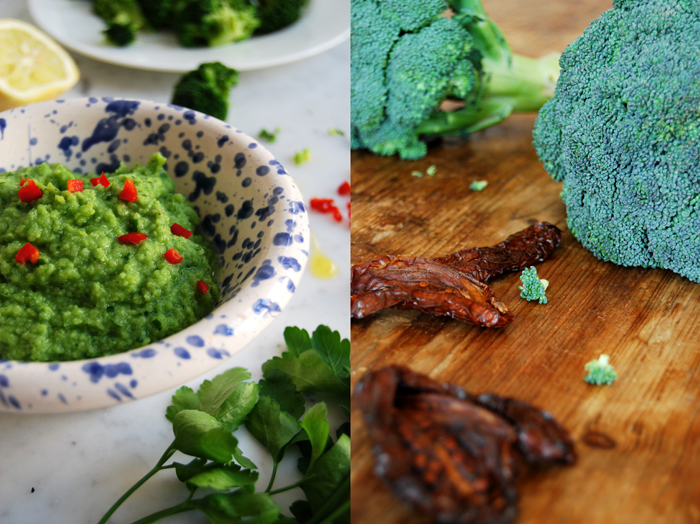 Put the rest of the broccoli (florets and stem cut into pieces) in a blender and mix together with some of the water used to cook the broccoli and sun-dried tomatoes. Add the parsley, garlic, ginger, anchovy, lemon juice, olive oil and mix well. Season the pesto with salt and pepper but keep in mind that the tomatoes used for the topping will add some saltiness as well. Arrange the spaghetti and the pesto on big plates and sprinkle with the chopped tomatoes, pieces of broccoli, chili and some more black pepper. Love this! 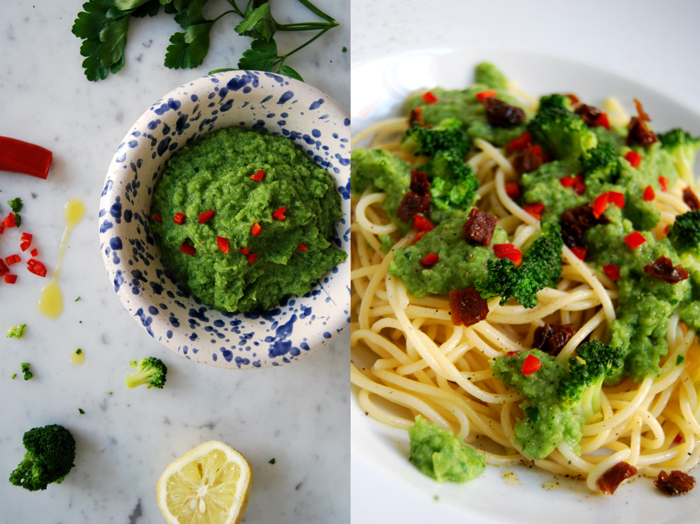 broccoli pesto is so clever. What a great dish. Thank you Cheri! It’s a great start into the pesto season!